Brush rollup in Buff'd Cosmetics' colors - soft pink and chocolate brown. 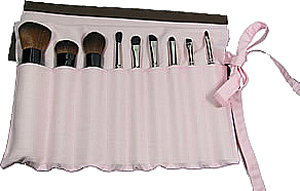 Nine slots to carry all of your brushes in and rolls up for easy travel. Handmade from 100% cotton. Washable.